Ladakh has a great diversity of climate. The weather of Ladakh remains chilly and cold for most time of the year. 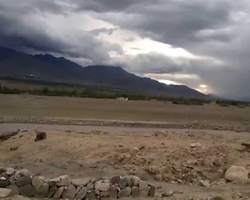 The frequency of rainfall is scanty making the region coldest desert of India. Rainfall averages up to 90 mm every year and is rare in winter. Glaciers in Ladakh take the whole season to melt. Temperatures remain in minus for almost 3 months from December to February. Summers are the ideal time to go to Ladakh as the skies are clear and offer panoramic views of the mountains. In summer season, the temperature in Ladakh becomes slightly warm with the maximum temperature records at 30◦C with minimum of -3◦C depending on the altitude and rainfall. The best climate of Ladakh is between months of June to October with warm weather, evenly distributed rainfall, and almost nil snowfall. The temperature goes up in summer, making it easier for travelers to explore the destination specially trekking. Winter days are sunny and bright with temperatures dropping below freezing point. The average temperature in the winter season is somewhere around -20° C to 15° C.